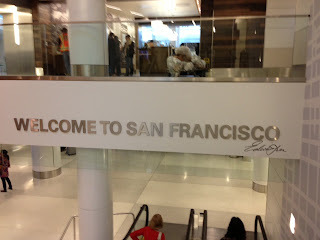 Work Hard, Train Hard, Play Harder: Day 1 - Arrival in San Francisco...what a crazy and fun filled day! Day 1 - Arrival in San Francisco...what a crazy and fun filled day! Wow...just wow. I really had know idea what to expect upon arriving in San Francisco. SFO has an art exhibit on display at the newly renovated Terminal 2. When I arrived at the hotel I was greeted by Lydia, who I've been communicating with through this entire journey and works for Nike in the media dept. She recognized me almost immediately and told me where to get set up and meet in another room to get ready for a photoshoot. I got to the hotel room, opened the door and found a big Nike bag waiting for me on the bed! I quickly got ready and headed to the other room where I met Robin who works for Team Epiphany (a NYC based non-traditional influencer marketing and PR firm) she quickly did some finishing touches on my outfit and hair. I also met finally in-person Karen, Elizabeth and Renisha ( the girls I have been tweeting with through this whole journey minus Tiara - her flight was delayed like the rest of us) She eventually met up with us at the shoot. So off it was to the van and photographer Jerome Love was there as well to take our pictures. He was very easy going and very patient with us while it took us some time to get into our fierce look faces - haha I'm excited to see what our profile pictures will look like. OMG - check out the drop on that hill!! YIKES!! We all went to dinner after the shoot at the lovely Scala's Bistro. Delicious! Wanted to stretch my legs before bed, so I took a walk to China Town with Justin. PHEW! What a day, can't wait to see what they have in store for Day 2.